Global leaders collected in Paris for the United Nations Framework Convention on Climate Change (UN FCCC) Conference of Parties (COP21) in early December to resolve collective action on the issue. The Earth’s changing landscapes and the telling experiences of climate refugees are the tangible evidence of three decades of research. The Earth’s conditions are inching closer to a tipping point, and with building momentum. The Paris Agreement has so much potential, but it’s been met with a mix of optimism and cynicism given the history of these sorts of talks. Paris is talked about as our last hope, but has enough changed since the Kyoto Protocol of 1997 or Copenhagen in 2009? 187 countries’ Intended Nationally Determined Contribution (INDCs) have been laid on the table, as they collaborate to avoid the 2 degrees Celsius limit. That goal can guide collective action in theory, but every country is inherently different – there are developed nations and developing nations, capitalist states and socialist states, indigenous leaders and Western bureaucrats. Greenhouse gas emissions are tied directly to industry and in essence, the ways that individuals, communities, companies, and global markets use energy. Have those changed enough in the past twenty years? Brazil and the United States are influential in energy and industry, with a complex relationship. (75%) of the Amazon rainforest is located within their borders and in the industrial boom that has positioned the country as a lead developing nation, (50%) of this vital ecosystem has been culled. The rainforest acts as the air conditioning unit for our planet, generating an atmospheric river of water vapor that helps to regulate the Earth’s temperature and purify the atmosphere of greenhouse gases. Deforestation weakens this regulatory cycle and the carbon sink that it functions as, therefore facilitating the concentration of greenhouse gases in the atmosphere, and Earth’s resultant warming. Thus far, Brazil has been forthcoming with their verbal commitment, and has actually reduced the rate of deforestation in recent years. Deforestation in Brazil: Rondônia is part of the Brazilian Amazon, on the border with Bolivia. 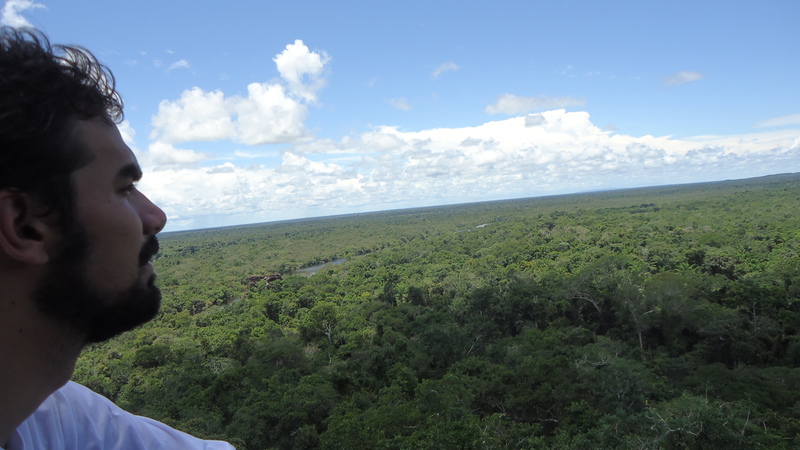 It is one of the peripheral areas undergoing expansion within Amazonia, growing from about half a million inhabitants in 1980 to more than 1.5 million in 2009. Within the Brazilian Amazon, Rondônia has the highest deforestation rate. It reached more than 34 percent in 2008, a drastic increase from 1978 when less than 2 percent had been cut. 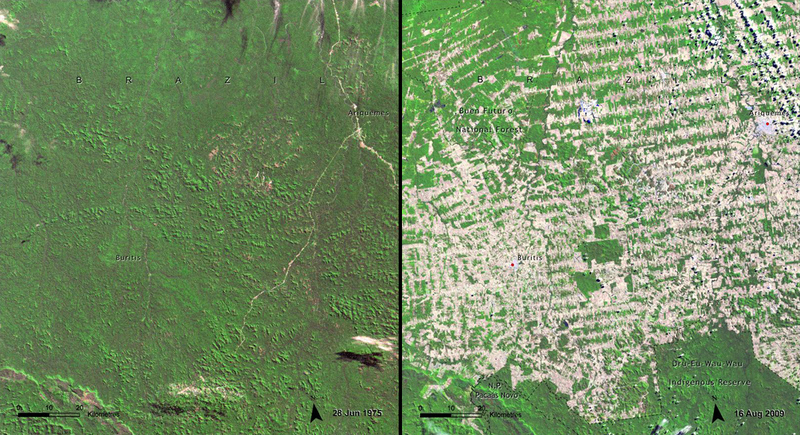 The principal causes of deforestation in the Amazon as a whole — and especially in Rondônia — are population growth due to government-promoted immigration, the growth of the wood-products industry in conjunction with the expansion of the road network, and burning for management of pastureland and agricultural fields. Source: United Nations Environment Programme (UNEP). From Latin America and the Caribbean Atlas of our Changing Environment (2010). Consumption of the Amazon rainforest is very much culturally ingrained, so the components of this issue are many-fold and interconnected: industrial agriculture and logging, illegal deforestation, job security, political expedience, lack of economic support for the existent environmental police. More than that, the United States has a stake in deforestation as well, as the primary importer of Amazonian wood, in addition to importing meat and soy. Local and global economies then merge, as coverage of deforestation in Brazil by NPR explored. I reached out to my friend Jean, from Rondonia, to learn about things from his perspective. Jean looking out at Rondonia across the Brazil-Bolivia border from the mountains of Bolivia. Rondonia is a young state, formed when people migrated West in the 1980s to support their families through cattle ranching, logging, or agriculture. Ultimately, it has supported the development of the entire country into global trade’s current agricultural powerhouse. Now, Brazil proposes to convert from deforestation to land preservation, reforestation, and a commitment to renewable energy. Garcia-Navarro’s coverage closes with a beckoning: “Brazil’s congress matters to us, all around the world.”, and it is true we need their commitment and follow through. 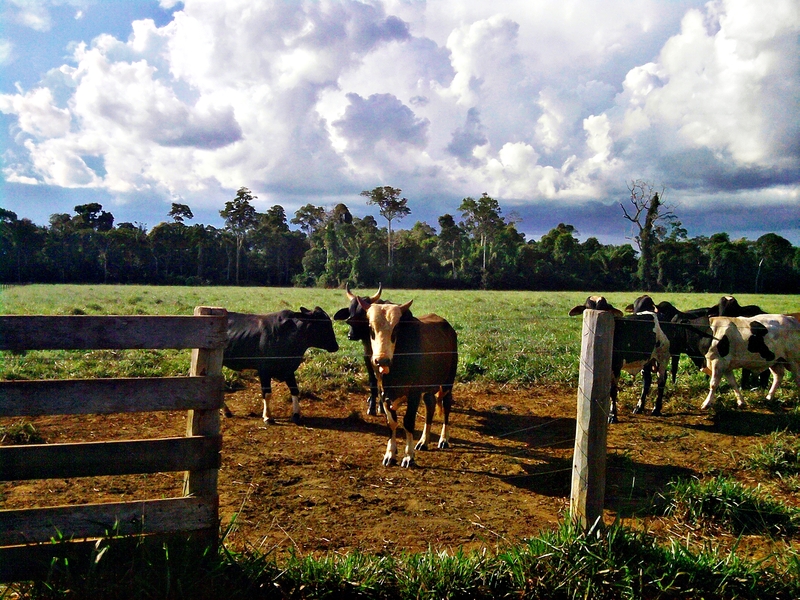 A rural area like Rondonia prospers, though unequally, thanks to the logging and cattle ranching industries on a global scale. Their ties are traditional and universal at the same time, affecting the livelihoods of vigilante rubber tappers and the international housing industry. It follows that the rest of the world’s actions matter to Brazil, given that their meat, soy, and timber exports go primarily to the United States. Intrigued by the dynamics at play, I asked a good friend from Rondonia to share his perspective. Jean grew up on a cattle farm in Rondonia and has witnessed the depletion of the Amazon alongside the growing prosperity of his state. Jean says that the COP21 climate talks are too bureaucratic – too far removed from the economic, political, and cultural realities of the rainforest – to have any real meaning for the fate of the Amazon. Source of 1620, 1850, and 1920 maps: William B. Greeley, The Relation of Geography to Timber Supply, Economic Geography, 1925, vol. 1, p. 1-11. Source of TODAY map: compiled by George Draffan, based on a map of the remaining roadless areas in The Big Outside: A Descriptive Inventory of the Big Wilderness Areas of the United States, by Dave Foreman and Howie Wolke (Harmony Books, 1992). He may have a point, but his criticisms have personal and shallow political notes that seem to limit their applicability to the realm of the elite. He was found guilty of fraud by Brazil’s Supreme Court and Prosecutor General, so he is currently appealing his criminal charges on technical grounds. Previously mayor of Rondonia and governor, Cassol assumed his Senate office in 2011; the accusations: giving government contracts to associates, friends, and family members when he was mayor. Herminio Coelho, one of the few opposition candidates and a member of the leftist party, calls their Senate assembly a “whorehouse” and “criminal enterprise” of leaders who would sooner see Rondonia without trees than help the environment, as landowners and profiteers of deforestation themselves. It resonates, then, when Jean states, “The bureaucracy is the problem,” and continues on about Brazil’s politics, clouded with corruption, bribery, and blackmail at local, state, and national levels. In Jean’s personal experience and in his political participation (voting is mandatory in Brazil), citizens tend to favor the familiar. “People will see a name they know and choose it because they recognize it. It doesn’t matter what they would do or their politics; it’s a family name so they think they can trust it.” At the same time, those families have vested interests and long-standing relationships that lead to circles of corruption that rise louder than the voices of the people. We saw it in the United States earlier in 2015, when money in politics as speech led to the funneling of $136 million into Republican candidates Ted Cruz, Jeb Bush, and (at the time) Rick Perry from Southern oil corporations with a mix of financial and social ties. So when Cruz hosted a forum in the US Congress during the Paris climate talks to state that he doesn’t believe climate change exists, we have to ask: is there truth in what he’s saying and who is he saying it for? Money’s influence in politics is at the root of COP21 criticisms as well. Kumi Naidoo, head of Greenpeace, addressed the coinciding People’s Climate Summit in Montreuil, stating “isn’t it strange that the people that are sponsoring the COP are including oil, coal, gas, and nuclear companies?”. The metaphor he uses is an Alcoholics Anonymous meeting sponsored by alcohol companies. On the other hand, Greenpeace is the foremost environmental global NGO, with 30 million supporters worldwide – and they accept zero donations from corporations. Naidoo goes on to explain that the people most affected by climate change currently are underrepresented being from smaller nations, tend to be low-income, and are predominantly brown and black people. Pew Research Center recently published a study of global concern about climate change. Latin America – specifically Brazil – reports the highest percentage of concern towards climate change and understanding that climate change is taking effect now. Trends show that high CO2 emitters are less intensely concerned about climate change. Ivo Cassol’s accusations towards the United States may come to mind again when we consider that in US politics, we debate its legitimacy rather than legislation and policy to move towards sustainable processes. Meanwhile, this year Brazil has seen Sao Paolo, its largest city, deep in drought and 150 homes destroyed after two dams holding toxic waste from an iron ore mine burst in Minas Gerais. Agriculture is largely rooted in tradition, so Jean helped me to understand by relaying his own experience in the geophysics field. When farmers are hesitant to accept soil analyses and chemical supplements he uses metaphors, most often likening it to medicine. He explains the combination of physics, math, and impressive technological equipment to eradicate contaminated liquid as identifying, locating, and treating cancer. Jean points out, “People fear what they don’t know about”. Who will tell people on the ground to translate the global impact of their actions or to liken the principles of sustainability to everyday decision-making? Who will translate the climate agreement created by bureaucrats into practical terms for the people whose economic livelihoods and cultural traditions will be affected? Bureaucrats used many metaphors used at the talks as well, although those can be reduced to strategically passionate political rhetoric. I prefer satirical coverage – its closer to the people’s commentary: telling, critical, and funny (see The Daily Show’s piece on Republican presidential candidate Ted Cruz and the oil industry). Is tradition the enemy of innovation, then? Are metaphors the only way to discuss these issues? Not necessarily. It’s unreasonable and unfeasible to turn away from our traditions immediately – they have valid social and economic significance. We’re looking at changes in infrastructure, lifestyles, and legislation. We have to be selective about what we bring into this new era and comprehensive of human experience. “It’s easy to write a bill, but to enforce it outside of industrialized cities is different,” Jean finds. He recalls that when Lula, Brazil’s first working class president (2002-2010) set out to address poverty in Brazil, it was through cost-effective, well-targeted programs. Luiz Inacio Lula de Silva was the child of migrants and later a metalworker and trade-union leader. His two-term presidency cannot be confirmed corruption-free, but he left office with 90% approval ratings. His legacy is lifting 29 million Brazilians out of poverty and into the middle class through economic supports for the impoverished. Jean adds, “I am a big fan of taxing people; it’s necessary to maintain the republic. It makes us closer to each other when the richer are closer to the poorer.” Poverty and climate change are both quality of life issues, with direct influence on immediate and sustained access to resources. Undoubtedly, either the costs or the responsibility to action fall on all of us. With the amount of money exchanging hands between the contributing industries and decision-makers in environmental policy, climate change and reforms like the Clean Power Plan could be the equalizer we need to bring local, community voices to the table. If followed through, Paris is the beginning of the end of the fossil fuel and greenhouse gas emissions era, a change that will fundamentally alter the way we live – if it is to have any effect. The treaty does take the aforementioned lifestyle changes into account, providing supports for communities dependent on the fossil fuel industry, in anticipation of the impact of altering their economies. We have reached the point (it could be argued that we reached it long ago) where life as we know it must change, due either to climate change or our response to it. 414 US cities and towns are guaranteed to be underwater as sea levels continue to rise. To respond proactively is no small undertaking; in reality nothing significant is. During our Skype date, Jean expressed his cynicism through another metaphor, “When I see rich countries talking about deforestation, it’s like a mask for them, I know it.” There is hope in the spirit of this agreement, however: consensus was gathered through indabas: a South African method of mask-less, transparent group deliberation. Instead of repeating stated positions, each party is encouraged to speak personally and state their “red lines,” which are thresholds that they don’t want to cross. But while telling others what they cannot compromise, they must contribute to the collective goal. A distinction must be made between the terms of the Paris climate deal as they are agreed upon and the terms as each country can actualize them. Being from the United States, I share in Jean’s cynicism towards results; we rarely agree to a course of action within the government, let alone in the global sphere. US Republicans have already threatened the work of the climate deal. So when it comes time to ratify and implement the terms of the Paris agreement in the United States, what can we expect? I am still hopeful in spite of that cynicism, largely because it is too soon to tell. If we do come up against more of the same corruption instead of capitalizing on this call for collaboration, the implications are huge. As Elon Musk stated at Sorbonne during the Paris climate talks, what we incentivize is what happens. As we look to next steps in ratification and implementation, the people will need to have a seat at the table and hold decision-makers accountable for results, nuanced policies to provide everyone with the means to contribute solutions that combine industry, innovation, and tradition. The talks in Paris are over; these leaders will return from the hill to the people, the other politicians, farmers and pundits, conversations and media narratives. What then? We’ll have to see – and act. The 192 world leaders who convened in Paris this year will revisit this project again in 2018, and in 5-year increments starting in 2020. I’ve found the hope surrounding these climate talks, the textured history that led us here, even the crippling effects of greed on reaching agreement to be unabashedly human. We’re capable of great things through sustainable and innovative technologies, but without communication and collective action at various levels to back it up – I’m not sure what to expect. Climate change and money in politics are both local and universal, social and industrial. Use whatever metaphor you will; in the end, we’re all in this together. Posted in analysis, engage, revolution, speak, write.Tagged Brazil, climate, climate change, cop21, deforestation, environment, global, human rights, industry, local, United States.